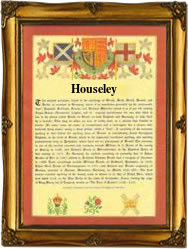 This interesting name is of early medieval English origin, and is a locational surname deriving from the place called Housley in West Yorkshire, near Ecclesfield, which has now all but disappeared and is remembered only in the name of "Housley Hall", and in the modern surnames of those descendants of the former inhabitants. The name means "the glade, grove or meadow of the house", derived from the Olde English pre 7th Century "hus", house, and "leah", grove, clearing in a wood, meadow or pasture land. The majority of the medieval population lived in cottages or huts rather than houses, so the "house" in the placename would have been a religious house or simply the local "great house", as in Housley Hall. Locational surnames, such as this, were originally given to the Lord of the Manor, or as a means of identification to those who left their place of origin to settle elsewhere. Regional and dialectal differences subsequently produced variations in the spelling of the name which, in the modern idiom, is found as: Hous(e)ley, Howsley, Houselee, and Ousley. The marriage of John Housley and Isabel Hill was recorded at Rotherham, Yorkshire, on August 13th, 1559, and on April 11th 1790 Joseph Housley, an infant, was christened at Manchester Cathedral, Lancashire. The first recorded spelling of the family name is shown to be that of Johannes de Houselay, which was dated 1379, in the "Yorkshire Poll Tax Returns", during the reign of King Richard 11, known as "Richard of Bordeaux", 1377 - 1399. Surnames became necessary when governments introduced personal taxation. In England this was known as Poll Tax. Throughout the centuries, surnames in every country have continued to "develop" often leading to astonishing variants of the original spelling.